Welcome to our 2016 Star of Excellence Issue of the South Shore Magazine. In this issue, you will see many of this year’s winners. Please congratulate them all when you visit their business and let them know how cool it is to be recognized as a South Shore business that demonstrates superior service and product selection EVERY single day! I would like to take a minute to thank all of our staff for another job – and issue – extremely well done. Your hard work and professionalism is well noticed by our clients, our readers and, of course, me! I would also like to make note of an additional service in my personal portfolio. In addition to my ownership of Black Rock Advertising, Publisher of South Shore Magazine and Producer and Lead Host of South Shore Live Radio, I am proud to announce my affiliation with Coldwell Banker Residential Brokerage as a REALTOR, based out of the Hingham Office. I have lived on the South Shore my entire life, which has provided me extensive knowledge of the region and has afforded me over 30 years of sales experience. If you or someone you know are considering buying or selling a property here on the South Shore or beyond (Florida, Arizona, California or anywhere in the world), my networks and Coldwell Banker can find you that dream property. I would be honored to work with you to achieve your property needs and dreams. I can be reached at 781.603.7862 via phone or text. I would also like to make note of several of our 3-year Star of Excellence Award winners: The Rug Merchant, Goodhale Insurance, Braintree Rug, Twinbrook Insurance, Dependable Cleaners, Glow, JB Auto C.A.R.E., Oasis Day Spa, Country Ski and Sport Inc., Alden Park Restaurant, Greenside Grille, Peel Pizza, Tsangs, Lobster Express, Charles David Salons and Woods Seafood. Lastly, I would like to welcome our new advertisers, including LaRossa Shoe/ LOUIE, King Jewelers, Artistic Dentistry of Hanover, Hanover Pediatrics, King Optical, Gosnold of Cape Cod, Blu Mussel Tavern, The Quarry, Johnny Kono’s Bar & Grill and Waxy’s Irish Pub! Please congratulate all of these businesses and let them know that you saw them in this issue of South Shore Magazine and how much you enjoy reading South Shore Magazine both in print, as well as digitally. Enjoy the rest of Indian summer and the autumn months ahead. We’ll talk to you again in December! 2016 Late Summer Issue ~ READ NOW! 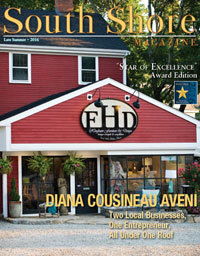 ‹ Welcome to our 2016 Late Spring Issue of the South Shore Magazine. › Welcome to our Early Winter 2017 Issue of South Shore Magazine.